Size 6 - $29.99 Only 6 left! Size 8 - $29.99 Size 10 - $29.99 Only 5 left! When plotting out a course to become a plundering pirate, everybody knows that the first thing you need is to assemble a crew of scurvy sea dogs that will follow you all the way to Davy Jones' Locker if need be. Of course, it isn't easy scrounging up a crew of swashbuckling scamps that can handle the adventurous life of a pirate, so if your kid wants to assemble the right sailors for the job, he's going to need an outfit that looks tougher than any other pirate who sails the seven seas...and this Boys Captain Scurvy Costume is just the kind of outfit to do the job! 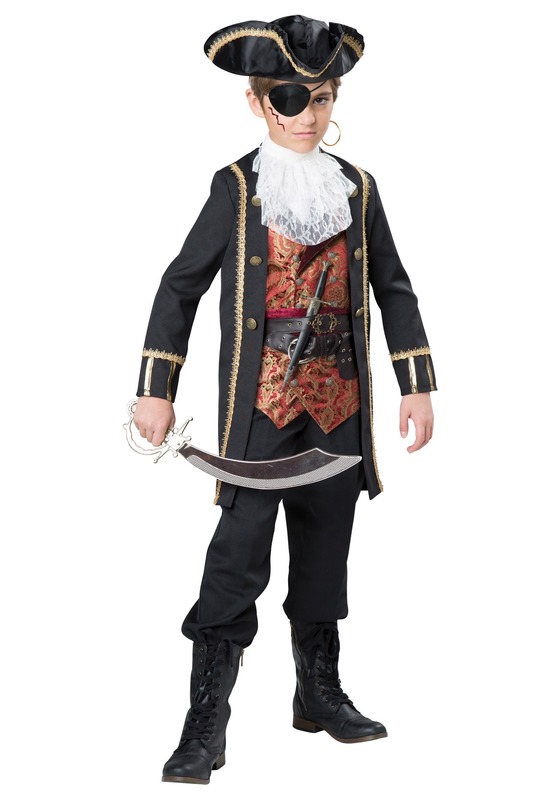 This Boys Captain Scurvy Costume comes with the commanding look of a salty sea captain who's seen his fair share of land-lubbers and long planks. All the things a roguish pirate could ask for in an outfit are here: A poplin jacket with dashing gold braid trim and decorative antique-gold-tone metal buttons; a printed vest front with a self-fabric waist and neck bands that fasten with Velcro; a frilly lace jabot sewn to a fabric neck band that also fastens with Velco (so it might look fussy, but it's a breeze to put on and take off! ); and even a satin tricorn hat with gold braid trim. Add a toy weapon, an eye patch, and an earring, and your little scalawag will be ready to take on the high seas with his merry band of buccaneers! excellent customer service, great price and beautiful costume.